Rio de Janiero: Rio said farewell to the Paralympics Sunday in a closing ceremony showcasing Brazil's love for music and celebrating what many consider to have been a surprisingly successful Games. The famous Maracana football stadium was packed, with the Paralympians themselves seated across the field, as proceedings kicked off with fireworks. Among the first performers was Jonathan Bastos, a Brazilian who was born without arms but has became an accomplished musician, playing instruments with his feet. Then it was Ricardinho, star of Brazil's gold medal winning five-a-side Paralympic football team, who brought out the national flag. Later, a minute of silence was to be held for Iranian cyclist Bahman Golbarnezhad, who died Saturday in a crash during the road race. Eleven days of competition where China dominated the medals table, followed by Britain, Ukraine and the United States, ended earlier Sunday with the last few events, including marathons and wheelchair rugby. Organizers said they had pulled off an against-the-odds success in the Rio de Janeiro Games. 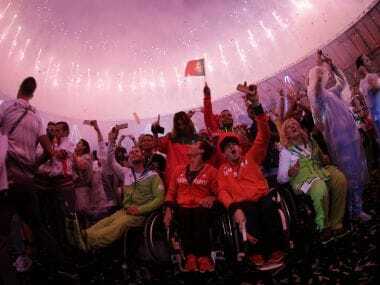 "Mission accomplished," said Carlos Nuzman, president of the Rio Olympic and Paralympic organizing committee. Referring to the political instability and deep recession weighing down Brazil as it put on South America's first Olympics in August and then the Paralympics, he conceded that it had been "a mission of many doubts." Philip Craven, the International Paralympic Committee president, said the cyclist's death "cast a dark shadow" but that overall "Rio 2016 will be remembered as a successful Paralympic Games and a Games that surprised many." Watching the Paralympic marathon along the seafront in Copacabana earlier, spectator Marcelo Augusto Miranda Costa said the Games had been "a moment of magic for the city." "We're going to miss them, yes," he said. The generally positive ending was quite the turnaround from a few weeks ago when the Rio organizers' woeful finances in the wake of the August Olympics and a stunning lack of interest in tickets raised fears of failure. By the end, officials said, they had sold 2.1 million tickets -- fewer than London in 2012 but more than Beijing four years earlier. Part of that success, however, was due to many tickets being sold for as little as $3 -- or given away to school children in an international fill-the-seats campaign. Also haunting these Paralympics was Brazil's political crisis. President Michel Temer, who had just taken power after his rival Dilma Rousseff was thrown out of office in an impeachment vote, was loudly booed by the crowd at both at the Olympic and Paralympic opening ceremonies. And tensions over a ban imposed by the International Paralympic Committee on the entire Russian team because of alleged state doping remain. Craven warned Sunday that "major change" will be needed from Russia to be allowed back into Paralympic competition. "Otherwise the Russian team is in big difficulties,” he said. The gap between the Olympic and Paralympic performances is gradually blurring with disabled athletes breaking records after records in Rio. Among the stars were Brazil's swimmer Daniel Dias who added four golds, three silvers and two bronzes to his existing medal haul from Beijing and London -- which has won him descriptions as the Michael Phelps of the Paralympics. There was amazement in the 1,500m track race when Algeria's Abdellatif Baka set a new record that was actually faster than the winning time by Olympic gold medalist Matthew Centrowitz in the same stadium a month earlier. However, Centrowitz won in what was by Olympic standards a near-record slow race, meaning Baka's outstanding time was of mostly symbolic significance. Once more, it was China that dominated overall, with almost 100 medals more than its nearest rival, Britain, which held a comfortable second place. The big country missing in the top section of the standings, however, was Russia, which during the London Games won 102 medals, including 36 golds.